Newly Redesigned! Smaller and More Power! This keychain stun gun is with your keys so you always have it available. This keychain taser gives YOU the advantage! The S.M.A.C.K. (Stun My Attacker Compact Keychain) Rechargeable Stun Gun! YES - it attaches to your keys! When you're most vulnerable to an attack, you don't want to be fumbling around the bottom of your purse trying to find your stun device. The SMACK was made to be attached to your keys so you always have it with you. Designed with microtechnology allowing a smaller profile, you still have the robust stopping power you expect in a professional self-defense product. 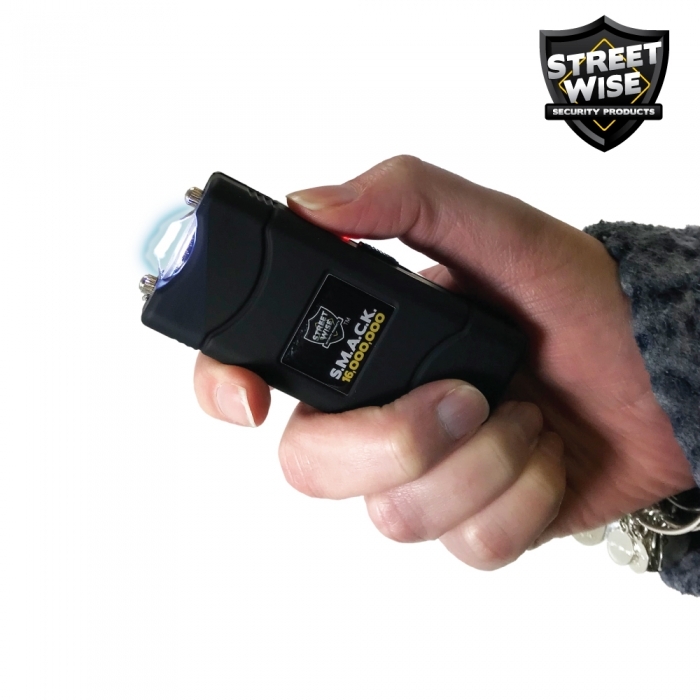 This powerful 16,000,000* stun gun measures at only 3" x 1.25" x .75", but 'puts the SMACK down on an attacker'! It's about the size of our Keychain Pepper Sprays, and just as easy to carry with you. It's also equipped with a bright LED flashlight! This impressive keychain taser uses top quality components to give it more power than most of the stun guns on the market today. Shining a bright light into someone's eyes temporarily blinds and disorients them. Ever get a light shined into your eyes at night? You can't see for a few seconds after that, can you? That's because your pupils have shrunk to pinpoints and not until they readjust are you able to see what's going on around you. Use this disorientation to make an escape or to use your weapon and then make your escape. As small as a handheld pepper spray, this keychain stun gun fits right on your keychain so it's with you whenever you're out. Using only top quality internal components, this little puppy puts out an amazing jolt of electricity you wouldn't expect from something so small. Is your Stun Gun on a Key Chain? Even though it has a ring for your keys, you also get a nylon holster with a belt loop for carrying on your side if you wish. This gives it more versatility and is still very concealable. 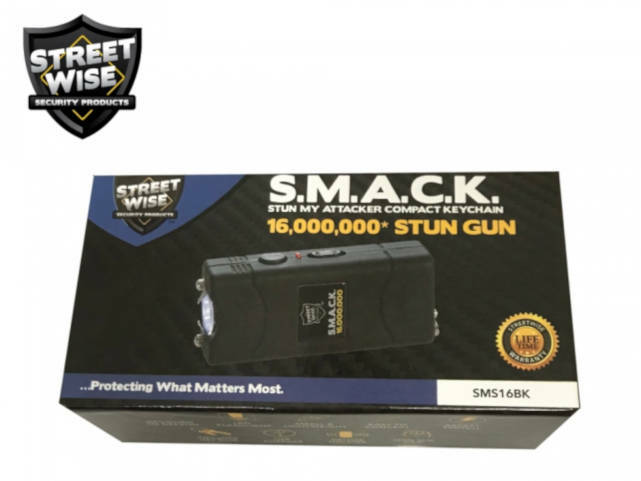 Comparable to other models claiming 16,000,000 volts, the SMACK mini keychain stun gun is one of the most powerful ones available. If you're looking for something compact but still has enough strength to be able to defend yourself, this is it. Half the Size | All the Power: Although the S.M.A.C.K. is about half the size of a normal stun gun, it has more power than most models on the market today. Just test firing this unit into the air is often enough to stop an attacker. Attaches to Your Keys: When the need arises to protect yourself, you don't want to be fumbling around to find your self defense device. With it attached to your keys, you don't need to be concerned about it getting stuck at the bottom of your purse. You will have it in your hand when walking to your home or car and will be ready to protect yourself at a moment's notice. Holster Included: Although this model is slim enough to carry in your pocket or purse, a holster with belt clip is included. Lifetime Warranty: The Keychain Stun Gun is made of the highest quality components and comes with a lifetime warranty. Rechargeable: The included USB cord plugs into the bottom of the unit. The other end can go into a USB port on a computer or a block charger (not included). Complete charging instructions enclosed.